US-North Korean relations remain very tense, although the threat of a new Korean War has thankfully receded. Still the US government remains determined to tighten economic sanctions on North Korea and continues to plan for a military strike aimed at destroying the country’s nuclear infrastructure. And the North for its part has made it clear that it would respond to any attack with its own strikes against US bases in the region and even the US itself. I don’t think we are on the verge of a new Korean war, but the cycle of belligerency and threat making on both sides is intensifying. And it is always possible that a miscalculation could in fact trigger a new war, with devastating consequences. The threat of war, perhaps a nuclear war, is nothing to play around with. But – and this is important — even if a new war is averted, the ongoing embargo against North Korea and continual threats of war are themselves costly: they promote/legitimatize greater military spending and militarization more generally, at the expense of needed social programs, in Japan, China, the US, and the two Koreas. They also create a situation that compromises democratic possibilities in both South and North Korea and worsen already difficult economic conditions in North Korea. We doesn’t have to go down this road—we have another option—but it is one that the US government is unwilling to consider, much less discuss. That option is for the US to accept North Korean offers of direct negotiations between the two countries, with all issues on the table. The US government and media dismiss this option as out of hand—we are told that (1) the North is a hermit kingdom and seeks only isolation, (2) the country is ruled by crazy people hell bent on war, and (3) the North Korean leadership cannot be trusted to follow through on its promises. But none of this is true. The North Korean leadership decided that they had to break out of this isolation and connect the North Korean economy to the global economy, and this required normalization of relations with the United States. Since then, they have repeatedly asked for unconditional direct talks with the US in hopes of securing an end to the Korean War and a peace treaty as a first step towards their desired normalization of relations, but have been repeatedly rebuffed. The US has always put preconditions on those talks, preconditions that always change whenever the North has taken steps to meet them. The North has also tried to join the IMF and WB, but the US and Japan have blocked their membership. The North has also tried to set up free trade zones to attract foreign investment, but the US and Japan have worked to block that investment. Second: the media portray North Korea as pursuing an out of control militarism that is the main cause of the current dangerous situation. But it is important to recognize that South Korea has outspent North Korea on military spending every year since 1976. International agencies currently estimate that North Korean annual military spending is $4 billion while South Korean annual military spending is $40 billion. And then we have to add the US military build-up. North Korea does spend a high percentage of its budget on the military, but that is because it has no reliable military ally and a weak economy. However, it has largely responded to South Korean and US militarism and threats, not driven them. As for the development of a nuclear weapons program: it was the US that brought nuclear weapons to the Korean peninsula. It did so in 1958 in violation of the Korean War armistice and threatened North Korea with nuclear attack years before the North even sought to develop nuclear weapons. Third: North Korea has been a more reliable negotiating partner than the US. Here we have to take up the nuclear issue more directly. The North has tested a nuclear weapon 5 times: 2006, 2009, 2013, and twice in 2016. Critically, North Korean tests have largely been conducted in an effort to pull the US into negotiations or fulfill past promises. And the country has made numerous offers to halt its testing and even freeze its nuclear weapons program if only the US would agree to talks. North Korea was first accused of developing nuclear weapons in early 1990s. Its leadership refused to confirm or deny that the country had succeeded in manufacturing nuclear weapons but said that it would open up its facilities for inspection if the US would enter talks to normalize relations. As noted above, the North was desperate, in the wake of the collapse of the USSR, to draw the US into negotiations. In other words, it was ready to end the hostilities between the two countries. The US government refused talks and began to mobilize for a strike on North Korean nuclear facilities. A war was averted only because Jimmy Carter, against the wishes of the Clinton administration, went to the North, met Kim Il Sung, and negotiated an agreement that froze the North Korean nuclear program. The North Korean government agreed to end their country’s nuclear weapons program in exchange for aid and normalization. And from 1994 to 2002 the North froze its plutonium program and had all nuclear fuel observed by international inspectors to assure the US that it was not engaged in making any nuclear weapons. Unfortunately, the US did not live up to its side of the bargain; it did not deliver the aid it promised or take meaningful steps towards normalization. In 2003, the Chinese government, worried about growing tensions between the US and North Korea, convened multiparty talks to bring the two countries back to negotiations. Finally, in 2005, under Chinese pressure, the US agreed to a new agreement, in which each North Korean step towards ending its weapons program would be matched by a new US step towards ending the embargo and normalizing relations. But exactly one day after signing the agreement, the US asserted, without evidence, that North Korea was engaged in a program of counterfeiting US dollars and tightened its sanctions policy against North Korea. The North Korean response was to test its first nuclear bomb in 2006. And shortly afterwards, the US agreed to drop its counterfeiting charge and comply with the agreement it had previously signed. In 2007 North Korea shut down its nuclear program and even began dismantling its nuclear facilities—but the US again didn’t follow through on the terms of the agreement, falling behind on its promised aid and sanction reductions. In fact, the US kept escalating its demands on North Korea, calling for an end to North Korea’s missile program and improvement in human rights in addition to the agreed upon steps to end North Korea’s nuclear weapons program. And so, frustrated, North Korea tested another nuclear weapon in 2009. In 2012 the North launched two satellites. The first failed, the second succeeded. Before each launch the US threatened to go to the UN and secure new sanctions on North Korea. But the North asserted its right to launch satellites and went ahead. After the December 2012 launch, the UN agreed to further sanctions and the North responded with its third nuclear test in 2013. This period marks a major change in North Korean policy. The North now changed its public stance: it declared itself a nuclear state—and announced that it was no longer willing to give up its nuclear weapons. However, the North Korean government made clear that it would freeze its nuclear weapons program if the US would cancel its future war games. The US refused and its March 2013 war games included practice runs of nuclear equipped bombers and planning for occupying North Korea. The North has therefore continued to test and develop its nuclear weapons capability. Here is the point: whenever the US shows willingness to negotiate, the North responds. And when agreements are signed, it is the US that has abandoned them. The North has pushed forward with its nuclear weapons program largely in an attempt to force the US to seriously engage with the North because it believes that this program is its only bargaining chip. And it is desperate to end the US embargo on its economy. So, why does US refuse direct negotiations and risk war? The most logical reason is that there are powerful forces opposing them. Sadly, the tension is useful to the US military industrial complex, which needs enemies to support the ongoing build-up of the military budget. The tension also allows the US military to maintain troops on the Asian mainland and forces in Japan. It also helps to isolate China and boost right-wing political tendencies in Japan and South Korea. And now, after decades of demonizing North Korea, it is difficult for the US political establishment to change course. However, the outcome of the recent presidential election in South Korea might open possibilities to force a change in US policy. Moon Jae-in, the winner, has repudiated the hard-line policies of his impeached predecessor Park Guen-Hye, and declared his commitment to re-engage with the North. The US government was not happy about his victory, but it cannot easily ignore Moon’s call for a change in South Korean policy towards North Korea, especially since US actions against the North are usually presented as necessary to protect South Korea. Thus, if Moon follows through on his promises, the US may well be forced to moderate its own policy towards the North. What is clear is that we in the US have a responsibility to become better educated about US policy towards both Koreas, to support popular movements in South Korea that seek peaceful relations with North Korea and progress towards reunification, and to work for a US policy that promotes the demilitarization and normalization of US-North Korean relations. A recently published study in Science Magazine by six scholars, “The fading American dream: Trends in absolute income mobility since 1940,” makes clear that the workings of the contemporary US economy have largely destroyed one of the core tenets of the so-called American dream–that children can expect to enjoy a higher standard of living than their parents. The following two figures show the results of their base line study. Figure A shows the fraction of children earning more than their parents by parent income percentile for selected birth cohorts. Figure B shows the same for the average of all children in the given birth cohort. Both charts make clear that the American dream is fading, and fading fast. In the 1940 birth cohort, nearly all children grew up to earn more than their parents, regardless of their parents’ income. Naturally, rates of absolute mobility were lower at the highest parent income levels, as children have less scope to do better than their parents if their parents had very high incomes. Rates of absolute mobility have fallen substantially since 1940, especially for families in the middle and upper class. At the 10th percentile of the parent income distribution, children born in 1940 had a 94% chance of earning more than their parents, compared with 70% for children born in 1980. At the 50th percentile, rates of absolute mobility fell from 93% for children born in 1940 to 45% for those born in 1980. And at the 90th percentile, rates of absolute mobility fell from 88% to 33% over the same period. Absolute mobility declined starkly across birth cohorts: On average, 92% of children born in 1940 grew up to earn more than their parents. In contrast, only 50% of children born in 1984 grew up to earn more than their parents. The downward trend in absolute mobility was especially sharp between the 1940 and 1964 cohorts. The decline paused for children born in the late 1960s and early 1970s, whose incomes at age 30 were measured in the midst of the economic boom of the late 1990s. Absolute mobility then continued to fall steadily in the remaining birth cohorts. Absolute mobility fell substantially in all 50 states between the 1940 and 1980 birth cohorts. Absolute mobility fell particularly sharply in the industrial Midwest, where rates of absolute mobility fell by 48 percentage points in Michigan and about 45 percentage points in Indiana, Illinois, and Ohio. The smallest declines occurred in states such as Massachusetts, New York, and Montana, where absolute mobility fell by about 35 percentage points. The authors tested the robustness of their results by changing some of their baseline assumptions. They redid their analysis using net income after taxes and transfers, rather than pretax earnings. They then adjusted the income variable to account for the growing use of fringe benefits. They also reran their study with new target ages, measuring child income at 40 and parent income at ages 35 to 45, in recognition that social changes may have lengthened the time before children reached their peak earnings years. They also tested to see if their results were sensitive to changes in marriage patterns and family size. And finally, they also carried out their study using individual rather than household earnings, looking at sons and fathers and then daughters and fathers. None of these adjustments changed their conclusion that absolute mobility has fallen substantially since 1940. The authors examined two different explanations for the dramatic decline in absolute mobility since 1940: slowing rates of economic growth and increasing income inequality. They tested these explanations using two counterfactual scenarios. In the first, they asked what would have happened to absolute mobility for the 1980 birth cohort if the rate of growth was faster, similar to what it had been in the mid-20th century. In the second, they asked what would have happened to absolute mobility for the same birth cohort if the rate of growth remained unchanged but income was distributed more equitably, as it was for the 1940 birth cohort. Under the higher-growth counterfactual, the mean rate of absolute mobility [for the 1980 birth cohort] is 62%. This rate is 12 percentage points higher than the empirically observed value of 50% in 1980, but closes only 29% of the decline relative to the 92% rate of absolute mobility in the 1940 cohort. The increase in absolute mobility is especially modest, given the magnitude of the change in the aggregate economy: A growth rate of 2.5% per working-age family from 1980 to 2010 would have led to GDP of $20 trillion in 2010, $5 trillion (35%) higher than the actual level. The more broadly shared growth scenario increases the average rate of absolute mobility to 80%, closing 71% of the gap in absolute mobility between the 1940 and 1980 cohorts. With the current distribution of income, higher GDP growth rates alone are insufficient to restore absolute mobility to the levels experienced by children in the 1940s and 1950s. If one wants to revive the “American dream” of high rates of absolute mobility, then one must have an interest in growth that is spread more broadly across the income distribution. Unfortunately, left unexamined are the causes of this growth in inequality. And this takes us to the workings of the contemporary US economy and more importantly, the core strategies embraced by corporations in their pursuit of profit: globalization, financialization, privatization, the gutting of social programs, the destruction of unions, and the restructuring of work. Said differently, the enormous growth in inequality over the last decades is the result of policies, many of them promoted by government, that were designed to boost the power and profits of a small group of people. Thus, “spreading growth more broadly across the income distribution” is going to require nothing less than the creation of a powerful social movement willing and able to challenge and change those policies. Employment growth remains weak in the United States. Many in the media happily encourage us to blame the growing use of robots, or automation more generally, for this situation. Their message is that we are just experiencing the consequences of technological progress and no one should want to fight that. However, that is just misdirection; the numbers make clear that it is corporate financial “wheelings and dealings,” not robots and automation, that is the primary cause of our current employment woes. If robots or automation were holding back employment growth we should see rapidly rising rates of output per labor hour or what economists call productivity. In other words, the new technology would allow companies to greatly increase their production with the same number or even fewer hours of human labor. And, as a consequence, the demand for labor would slow, leading to weak employment growth. Labor productivity is a measure of economic performance that compares the amount of goods and services produced (output) with the number of labor hours used in producing those goods and services. It is defined mathematically as real output per labor hour, and growth occurs when output increases faster than labor hours. . . . Technological advances, greater investment in machinery and equipment by businesses, increases in worker skill and experience, and other improvements to production can all lead to labor productivity growth. The problem for those who want to blame our labor market woes on robots and automation is that US productivity gains have been historically weak, not strong, during this economic expansion. 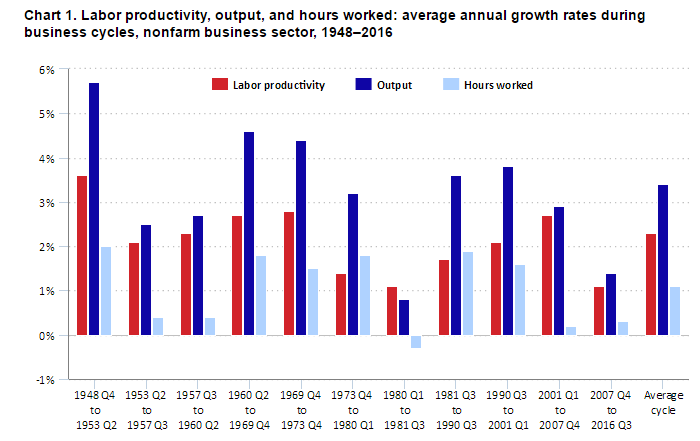 Chart 1 shows the growth in output, hours worked, and labor productivity (shown by the red bar) for the non-farm business sector over every business cycle starting in 1948, as well as for the average business cycle for the historical period. Of course, our current cycle is not yet over, and the data in this chart only take us through the 3rd quarter of 2016. But our current expansion is already the longest, and since productivity tends to fall the longer an expansion goes on, we are unlikely to see much of an improvement in the numbers over the rest of the cycle. As we can see, the growth in labor productivity in the current business cycle, at 1.1 percent, is tied with the 1980-1981 cycle for the lowest rate of productivity growth for the entire historical period. Labor productivity growth for the average cycle is 2.3 percent. The current business cycle also has the second lowest rate of growth in output. 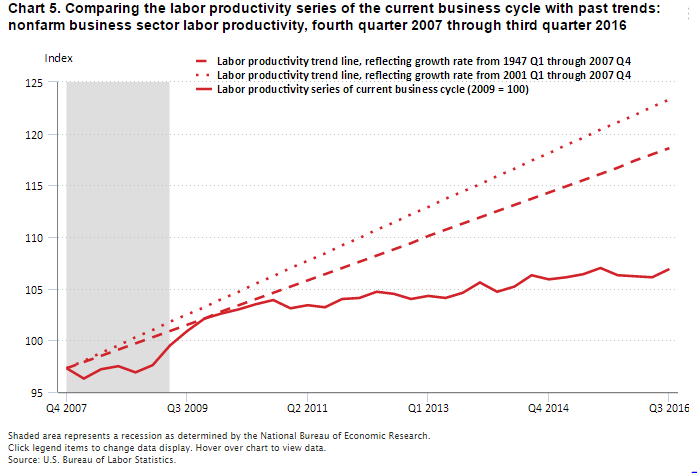 Chart 5 offers another way to appreciate how weak productivity growth has been during the current business cycle. It compares the growth in labor productivity over this cycle with the growth in productivity over the previous cycle (2001 to 2007) and the longer period 1947 to 2007. Through most of the Great Recession, labor productivity lagged behind historical growth rates, but then it achieved above-average gains coming out of the recession and into the early quarters of the recovery. The U.S. economy actually caught up to the long-term historical trend (the dashed red line) in the fourth quarter of 2009, although it was still slightly behind the trend from the last cycle (the dotted red line) at that point. However, after 2010, productivity growth stagnated and a substantial deficit relative to historical trends developed over the next 5 years. By the third quarter of 2016, labor productivity in the current business cycle had grown at an average rate of just 1.1 percent, well below the long-term average rate of 2.3 percent from 1947 to 2007 and even further behind the 2.7 percent average rate over the cycle from 2001 to 2007. In short, if robots or automation were replacing workers this would be reflected in strong productivity growth. In fact, we see quite the opposite: the weakest productivity growth for any business cycle in the post-1947 historical period. While high productivity does not guarantee strong wage gains, workers normally find it easier to force business to boost wages when output per labor hour is significantly growing. Low productivity gains, on the other hand, normally translate into weak wage growth. And that is what we see today. 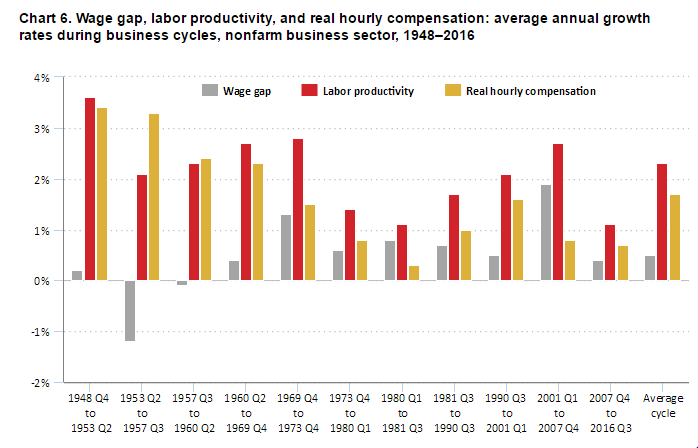 Chart 6 shows the growth in labor productivity, real hourly compensation, and the wage gap (difference between productivity and compensation) over the 1948 to 2016 period. [This] is low by historical standards. The rate is lower than the average real hourly compensation growth rate of 1.7 percent observed during other business cycles. The rate is also below the rates of all other cycles, except for a brief six-quarter cycle in the early 1980s. Note also that the low growth rate of the current business cycle is a near-continuation of the similarly low growth rate of the early-2000s cycle (0.8 percent). For all the talk about technology, business investment has been weak, as illustrated in the following charts from the Economic Policy Institute. 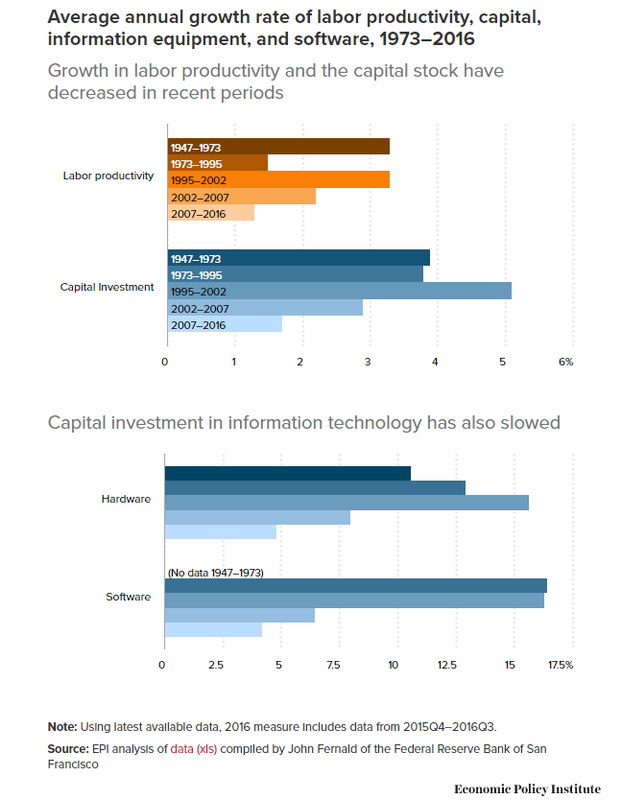 Capital investment has been slow compared with past periods and the same is true for business investment in information technology equipment and software—the alleged drivers of technological innovation. So, what are businesses doing with their ample profits? The answer is that they are using them to repurchase their own stock in order to boost stock prices (and managerial salaries) and to pay large dividends to their stockholders. In other words, engaging in financial transactions to enrich those at the top. Figure 1, from Yardeni Research, shows the annual dollar value (in billions) of stock buybacks, which is the repurchase of shares by the company that initially issued them, for S&P 500 listed firms over the years 1999 to 2016. Figure 2 shows annual dividend payouts for these same firms. Each has been substantial since 2003, although the period of the Great Recession did produce a steep short term dip. 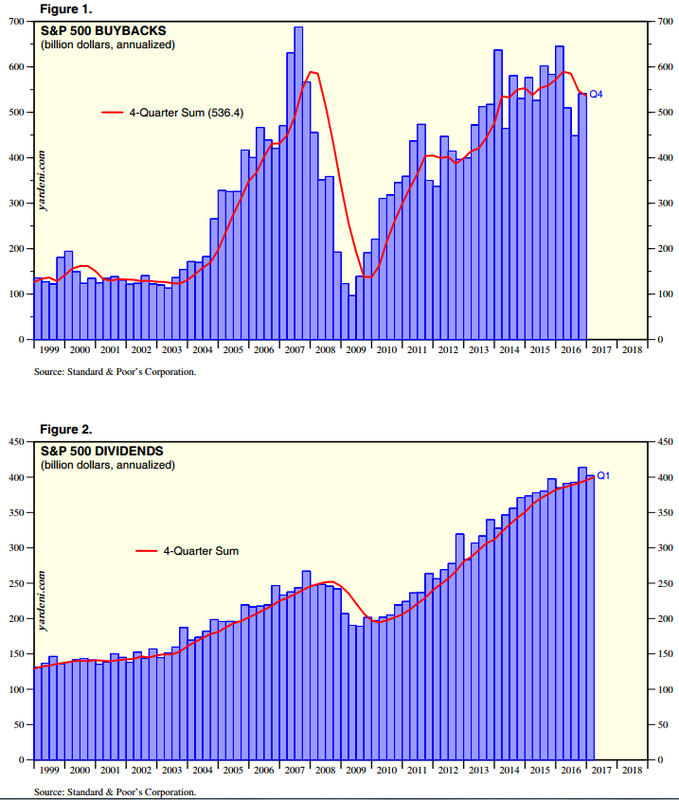 Figure 12, by showing the value of S&P 500 buybacks and dividends as a percent of operating earnings, illustrates just how substantial this financial activity has become. Operating earnings are a key measure of profitability and are calculated by subtracting direct business expenses–such as the cost of production, administration and marketing, depreciation, etc.–from revenues. 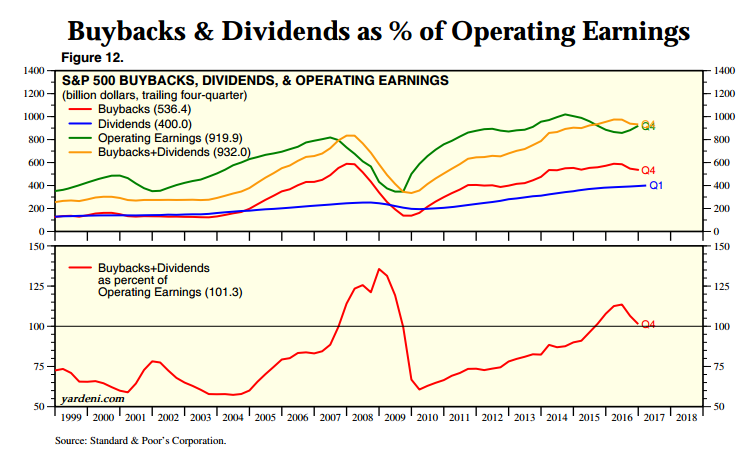 What we see is that business spending on buybacks and dividends has actually been greater than total operating earnings for several years since 2007, including 2016. In short, S&P 500 listed businesses are shoveling almost all their profits, and then some in many years, into financial dealings. No wonder real capital investment has been weak and productivity, wage, and employment growth slow. Forget that stuff about robots and automation. Business pursuit of private profit drives our economy. Sadly, firm profit-maximizing activity increasingly appears to view job creation as a distraction. The official US unemployment rate fell to 4.5 percent in March 2017; that is the lowest unemployment rate since May 2007. Many economists, and even more importantly members of the Federal Reserve Board, believe that this low rate indicates that the US economy is now operating at full employment. As a result, they now advocate policies designed to slow economic activity so as to minimize the dangers of inflation. Unfortunately, the unemployment rate is a poor indicator of the current state of the labor market. For one thing, it fails to include as unemployed those who have given up looking for work. An examination of recent trends in the employment/population ratio (EPOP) makes clear that our economy, even during periods of economic growth, is marked by ever weaker job creation. It also appears that this is not a problem correctable by faster rates of growth. Rather, we need to change the organization of our economy and reshape its patterns of income and wealth distribution. The employment/population ratio (EPOP) equals the share of the non-institutional population over 16 that works for money. The non-institutional population includes everyone who is not in prison, a mental hospital, or a nursing home. 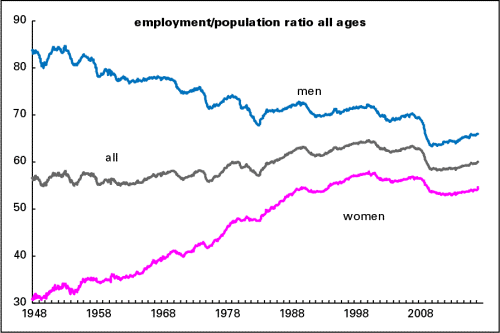 The figure below, from a LBO News blog post by Doug Henwood, shows the movement of the EPOP for all workers and separately for male and female workers. As we can see, the participation rate of male workers fell steadily from the early 1950s through the early 1980s recession years. It then slowed its decent over the next two decades until the 2008 Great Recession, which caused it to tumble. Its post-recession rise has been weak. The male EPOP was 66 percent in March 2017. The female EPOP rose steadily from 30.9 percent in 1948 to a peak of 58 percent in 2000. Thereafter, it drifted downward before falling significantly during the Great Recession. Its post-recession rise has also been weak. It was 54.7 percent in March 2017. The overall EPOP, the “all” line, began at 56.6 percent in 1948, hit a peak of 64.7 percent in April 2000, and was 60.1 percent in March 2017. If the same share of the population were employed today as was in December 2007, just as the Great Recession was taking hold, 4.3 million more people would have jobs. If it were the same share as the all-time high in April 2000, 7.3 million more people would be working for pay. Either one is a big number, even in a country where 153 million people are employed. In other words, it is likely that there are many people who want and need work but cannot find it. And it is important to remember that the EPOP only measures the share of the non-institutional population with paid employment. It tells us nothing about the quality of the existing jobs. 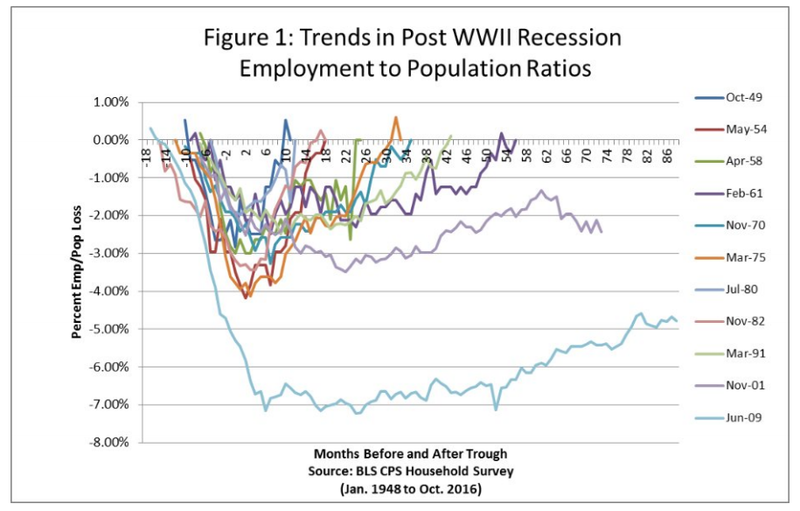 It is easier to appreciate the growing inability of our economy to provide jobs by examining the movement of the EPOP over the business cycle. Figure 1, from a note by Ron Baiman, a member of the Chicago Political Economy group, shows the number of quarters it takes for an economic expansion to return the EPOP to its pre-recession level. As we can see, the expansion that started in November 2001, and which lasted for 73 months, ended with an EPOP that was 2.48 percent below where it had been before the start of the March 2001 recession. This was the first post-war expansion that failed to restore the EPOP to its pre-recession level. But, it is very likely not the last. In particular, it appears that our current expansion will be the second expansion. Our current expansion started June 2009 and as of October 2016 it was 88 months long. Yet, it remains 4.78 percent below its pre-recession level, which as noted above, was already lower than the EPOP at the start of the March 2001 recession. Given that the EPOP is currently growing very slowly, it is doubtful that it will close that gap before the next recession begins. 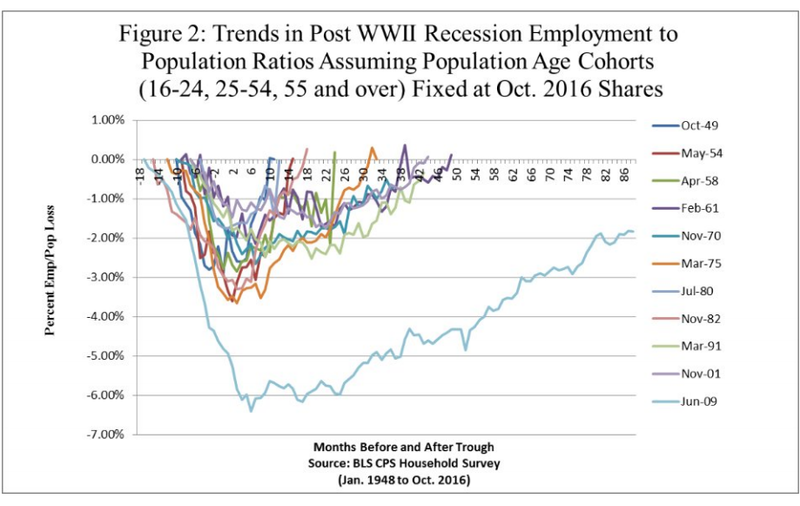 Figure 2 below repeats the analysis of Figure 1, but does so within population cohorts of ages 16-24, 25- 54, and 55 and over, whose shares are held constant at October 2016 levels to remove the effects of changing demographics over the post-war period. For example, this eliminates the impact of an increased over 55 population share that is likely to reduce the overall employment/population ratio. In short, we can rule out an aging population as the primary cause of the growing inability of economic growth to ensure adequate job creation. This behavior certainly pays off handsomely for top managers and already wealthy stock holders. But it is not so great for the rest of us, especially for those workers–and their families–who find paid employment increasingly difficult to obtain, even during an economic expansion.